PUNJABI RHYMES – Yes! 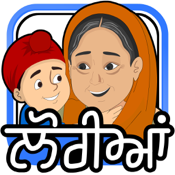 It’s once again Vismaad to bring you the first ever Punjabi rhymes app. A collection of 11 rhymes, popularly known as lorian or baatan in Punjabi folklore, melodiously sung accompanied with cool animation videos. Kids will love to watch over and over again. Fun way to learn Punjabi at the right age. NO STREAMING. NO SEPARATE downloads. Just download the app once, no downloads further, no streaming.